hai salam kenal :) wah apa rahasianya bisa naik berat badan? Selamat Tahun Baru 2011. Semoga di 2011 selalu sehat, ceria, bahagia dan sukses. Waw…..aq suka travelling juga, backpaker-an, suka banget! Terimakasih share2 tulisannya, menarik. baru berkunjung hari ini nih ;) Semoga dengan ngeshare tulisannya jadi makin care sama sesama. *bangun* *tidur lagi* *bangun lagi* *tidur lagi* Perkenalkan.. saya cucunya mbah surip..
yang pasti, kalo diliat dari isi tulisannya, nona yg satu ini pasti cerdas n gokil bgt. Setiap membaca tulisan nona mungil ini, saya seperti sedang bernostalgia dengan “lupus”nya hilman hariwijaya yang kesohor ke seantero langit pas jaman saya sma.seorang Maestro baru telah lahir….selamat ya! btw, gw mau tanya nama pulau yang lo pernah kunjungi dari pramuka namanya apa yah? Eh.. Ini becanda ya..? Hehe.. Terima kasih banyak ya.. It means a lot to me.. :) Salam kenal Hadi..
Salam kenal dari Blogger Semarang. Ngomong2 tahun baru mau traveling kemana nih mbak? Salam kenal ya mbak… btw besok ini yang ke genting kan ya? 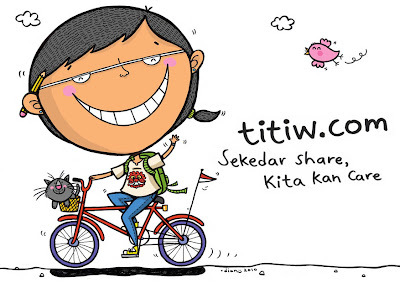 waaaaa… kak titiw blognya keren. aku jadi minder. ga ica disain web, apalagi aku sempet lama terjebak dalam cinta yang rumit dengan Linux Ubuntu, jadi makin repot. waaaaa… kak titiw hebat…. sering jalan2. tempat mana lagi yang mau disamperin? waaaaa… kak titiw blognya keren. aku jadi minder. ga ica disain web, apalagi aku sempet…. Hai Kakagh…Lam nal yach! Blognya kueren dech. Trus kag Tiw juga imoetz gt. Maac3H Kak4kz.. Lam knal j03ga. salam blogger..websitenya nyaman maju terus ya..
Ada lagi gak acara blogger seputaran Blok M? Kalo ada mau ikut. Dulu ketemu Titiw di esteler77 yang di jalan Adityawarman, udah lama. Well, it’s actually more a testimonial then a story, since in this post, I am describing my wife through her spelling name (sounds familiar with this thing?). If yes, then you must used to have a diary or at least, ever written some craps in your friends’ diary. R-A-H-M-A-Y-A-N-T-I-A-K-M-A-R. Thus, there are R-A-H-M-Y-N-T-I-K contained in her full name. Let’s see what she got! She’s very rigid or you may want to say in a more positive context, ‘discipline’. Not in every single thing, of course but in term of health and hygiene. In daily basis (prior sleeping), she pushes me to always do facial cleaning, tooth brushing, and hand and foot washing. Although, she never told me to take a night bath (strange). Even if I got home after having a long day working, she wouldn’t tolerate me to directly go to just sleep! No need to tell you by words on this. She has moved wheeling on every beach that she already visited. It’s always great when a beautiful girl can do some physical movement/activity. No, it’s not just another general or standard adjective that you can tell about a personality of a person. She actually has every penny to buy some expensive branded shoes or may be even car (could tell you that since I know her bank account amount *hahaha*). Otherwise, she often (if I can’t say always) takes a public transportation from home to her office. And I tell you what, she was my one and only girlfriend who had no problem riding my old motorcycle everywhere (never try taking her to a wedding by it though, shouldn’t I? hehe). As opposite as her look, she is a grown up woman inside. She is not a type of woman who does not keep-a-good-image or in letter-lux translation to Indonesian slang, jaim/jaga image, but her thought, principle, and act always make her a mature girl. In relation with her humbleness for instance, she would spend most of her bank account on a small tiny but well-designed and homey house than spent on a brand new car (for I always dream about it; re: changing car). Don’t want to be sexist, but somehow as a man, I like more a woman who most of the time (if the word ‘always’ is impossible) fulfills what her man wants. Or in other words, say ‘Yes’ for almost every single thing that I wish for. Of course, you can’t expect something that beyond her reach or ability, but when I came to ask to do or to give something simple, she would say yes. Something daily like, what movie to watch, what food to eat, what event to attend, to something that a normal girl would think twice to accept like, attending a football match in a stadium full of noisy boys, wearing an oversize-my-favorite-football-club jersey, or overnight at a mosque during Ramadhan. I feel loved when my woman say “Yes” to my request. There are lots of beautiful girls in Indonesia or rich girls who can buy anything branded and fancy to simply looks good. My wife is beyond that! Her pure Indonesian face of beauty with average height and ideal weight covered with soft brown skin are more than enough in making my eyes pleased and be proud. Such gifted gorgeousness is completed with classy tastes. She is already beautiful without having to put a bold make up. She already looks cool without having to wear an expensive clothes. For her, it is not about how much the price or how significant the brand is to judge something is sufficiently good. As the comparison, when I can’t tell which product is better, I just choose the more expensive one. To me, that’s silly but makes sense. By having a fine taste, she could look great even by wearing some cheap apparel or make our bedroom nicely comfortable by arranging some stuffs having reasonable prices. At the end of the day, just like some say, money indeed can’t buy taste. This alphabetic reference of my wife means a lot to me. She has been being my Istri (wife) since 23 March 2014, as when my life changed so much in a positive way. She’s a very faithful wife by which, if I ever asked to only choose one thing came from a wife I would gladly request for a faithful/loyal one. My happiness will also be even more happier since she is currently 5,5 months pregnant and will be the Ibu (mother) of my child. Oh, did I mention that it would be a boy? I know, I know. It seems that as the last alphabet, I might already be losing focus and creativity in choosing a sophisticated adjective. However, one of our closest friends once said that if you could be anything, be kind. While it is a general word describing generosity, I could not agree more with him. It means that you can be good in every single way possible. Of course, if my wife was not a kind person, I would have not been married to her. Ps: pardon my acak kadut english, eh!